Maxime Martin and Graham Davidson scored their first British GT Championship victory today at Spa-Francorchamp, in the fifth round of the season. The Belgian driver and his British teammate won the race in the #47 Jetstream Motorsport Aston Martin V12 Vantage GT3. After two hours and forty laps on the iconic Belgian circuit, they defeated defending champion Rick Parfitt Jr and his teammate Ryan Ratcliffe in the #1 Team Parker Racing Bentley Continental GT3. Marco Sorensen and Derek Johnston finished third in the #17 TF Sport Aston Martin Vantage GT3. Jonny Adam and Flick Haigh, who started the race from pole in the #75 Optimum Motorsport Aston Martin, finished fourth. The winners of GT4 class are Jack Mitchell and Dean MacDonald in the #43 Century Motorsport BMW M4 GT4. They defeated Charlie Fagg and Michael O’Brien in the #4 Tolman Motorsport McLaren 570S GT4. Daniel McKay and Finlay Hutchison finished third in Equipe Verschuur’s #10 McLaren. 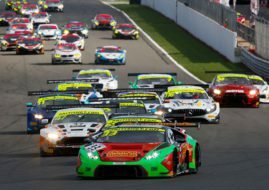 The next round of the British GT Championship would be another 2-hour race, scheduled for August 5 at Brands Hatch.